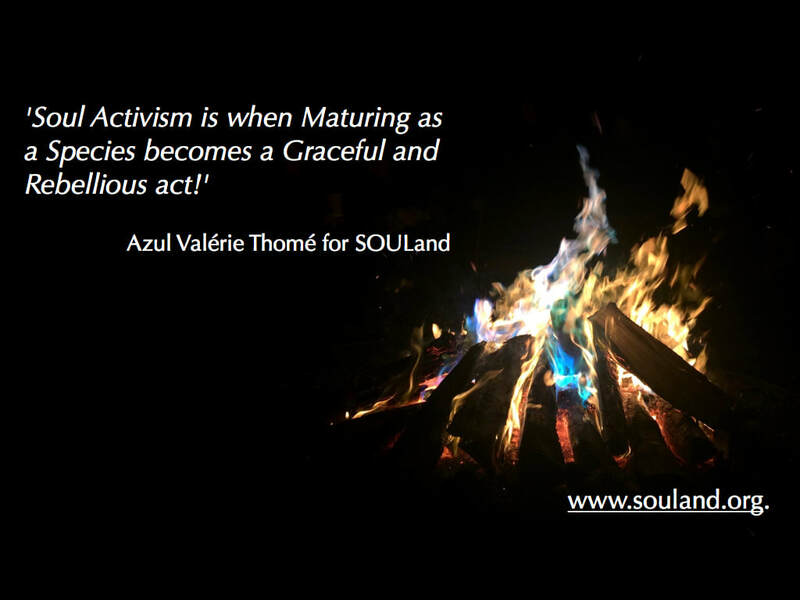 SOULand is a response to our uninitiated, traumatised, collapsing and transforming world. It is a growing programme of nature-informed rituals, a mycelium of trainings&apprenticeship, eARTh and mentorship. To restore and weave our humanity back to a deep & wild relationship with the Earth, mature the human soul and co-create the world of our longing. It is a vision of sanctuary, a great giveaway. It is soul activism. Longing is the language of SOUL. A current moving through us, whispering wildly to us how to come back Home. Initiation is a invitation to wildly court and lean into the SOUL of four Sisters - Grief, Love, Death and Birth. There is no true initiation without the ‘small’ death of our personality, our set positioning in life or our childlike naivety. 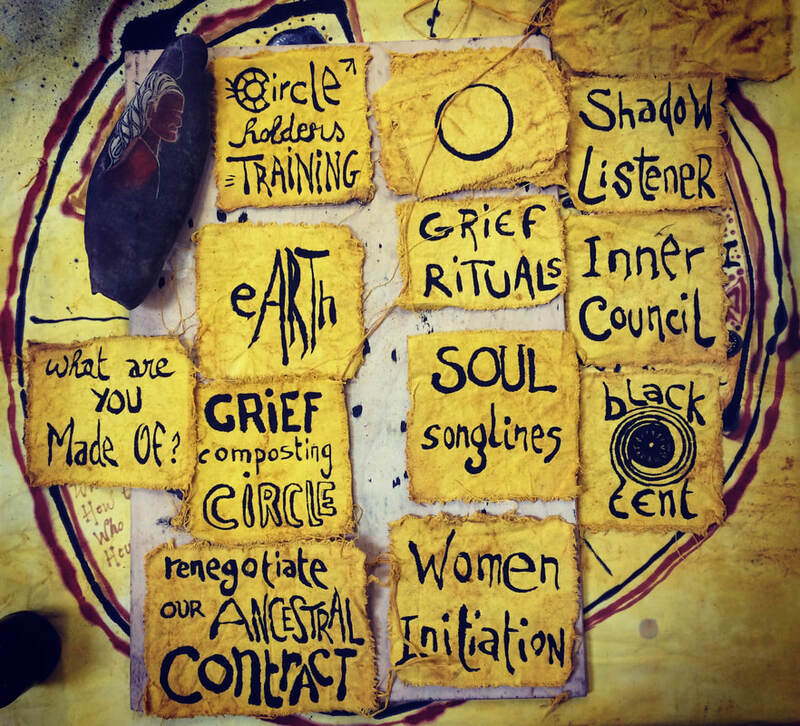 The Circles hold an important part in total darkness as if in a compost heap, a womb or a kiva. 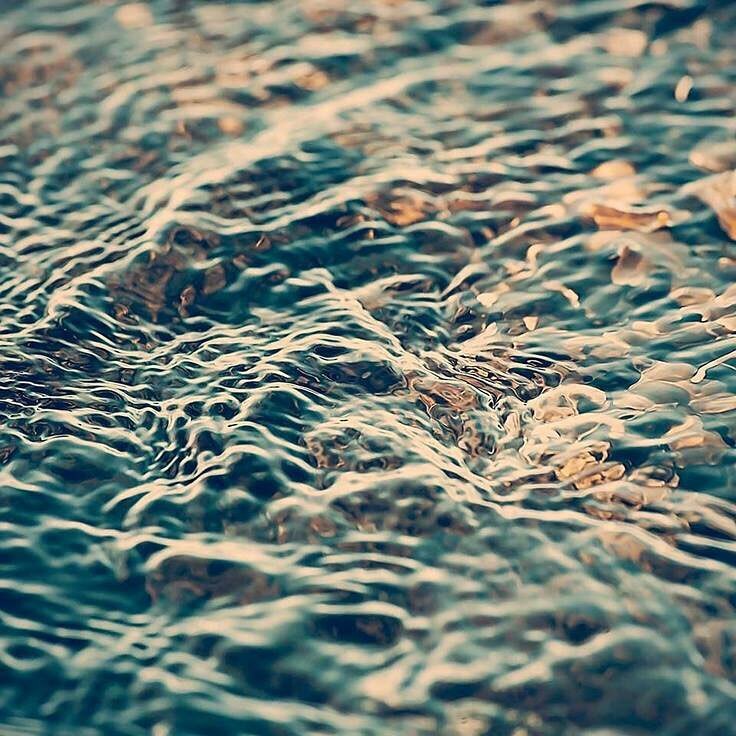 Sounds and wailing are freely used to encourage our wild and sensuous selves to be present. Wild means of nature, not feral or out of control! One grey day of December I found myself by the river Dart in Devon who gifted me with an astonishing message of Love. So far I have spoken with and recorded Joanna Macy, Simon Be, Li An Phoa, Jon Young, Francis Weller, Manda Scott, Pat McCabe, Megan Hollingsworth, Stephan Harding, Pablo Servigne and Stephen Jenkinson… each one bringing a thread for a cloth weaving in the past, present and future… I anticipate mystery and our bone memory to be awakened by it. I have a vision of an Earth Temple at the edge of every town and every city. A circular womb-like place of astonishing beauty celebrating all of creation .. a place to rest into, reflect, pray, listen, speak and sing to all sentient beings and restore our animist selves. 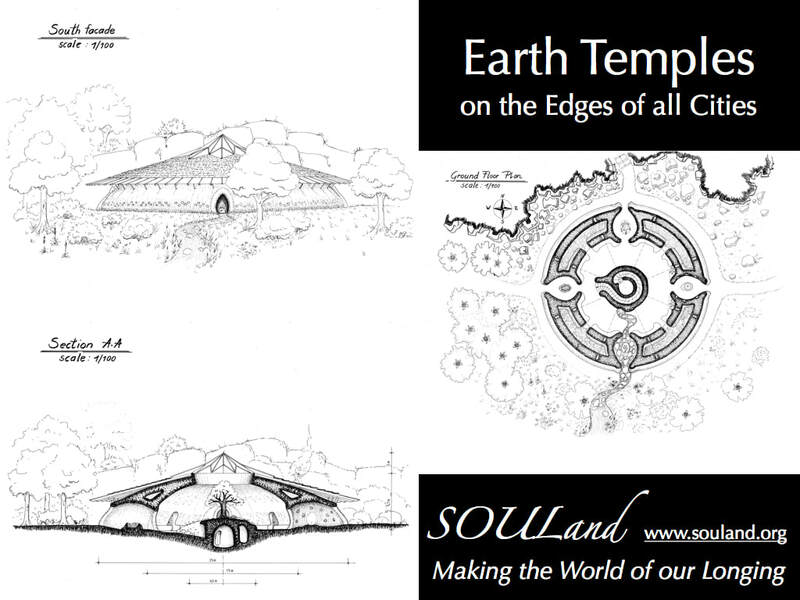 After a year of dreaming, drawings of the Earth Temple have arrived. It is 25 Meters wide. Blessed by 2000 generations of ancestors. 4 living entrances and a Kiva in the centre. A Feminine shaped Temple for all. Made of the local material found on site. I am calling for a meeting with anyone who resonates with helping create the first Earth Temple - Makers, Cobbers, Strawbellers, Glassmakers, Carpenters, Alchemists, eARTh Artists, Planners, Weavers of Natural Laws, Shambhala Warriors, and other cracked and called human beings. Can we ponder on the difference in our own heart and the impact on our soul? We are increasingly noticing that we need to gather and rise up in circles and community groups to meet the enormity of the consequences of our long term disconnection to the interconnectedness with all of Life thus bringing up an immense grief, un~skilled and feared in many of us. 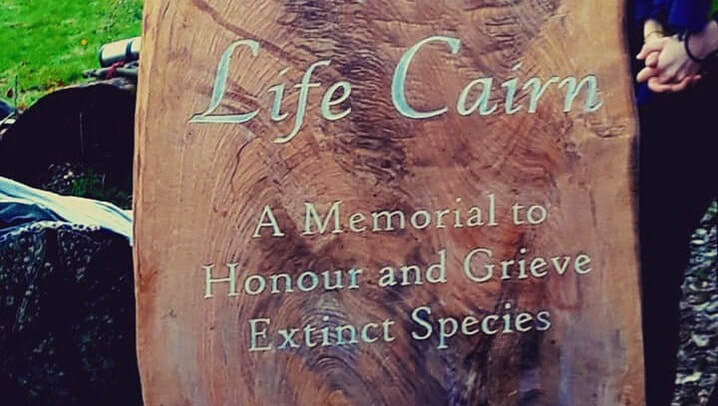 On the 1st December, the Totnes community is invited to create a Life Cairn, a memorial for the honouring of Extinct Species. Please join us if you are touched by the 6th massive extinction of Life on Earth and want to give Away your gifts, broken hearts and talents to this offering. Artists, singers, musicians, children, elders, mothers, fathers, lovers of all sorts and all two, three and four legged welcome! 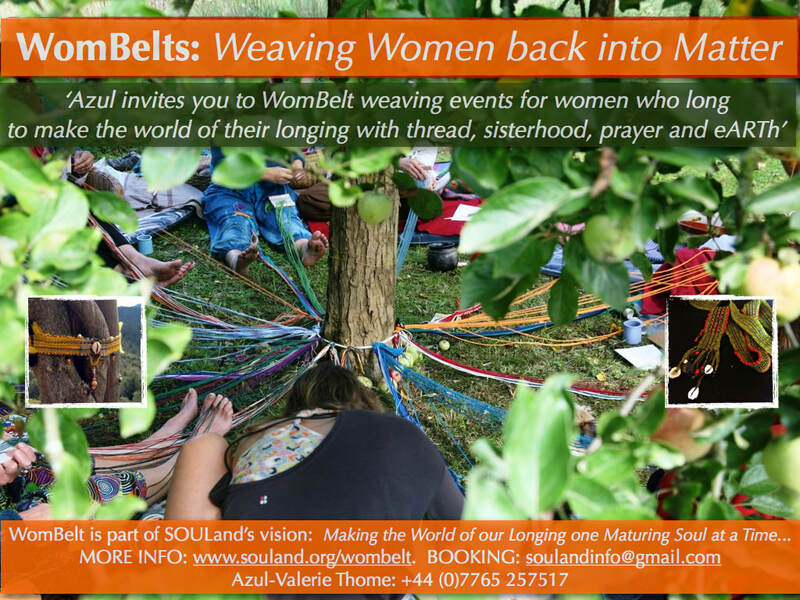 "WomBelt: Weaving Women back into Matter"
Our womb is a place of great wisdom for ourselves and one another, to stand soulfully and maturely on and for our Earth's wellbeing. Any trauma will create a dam and a great blockage to the river of our lives. A Wombelt is made using the backstrap weaving method. 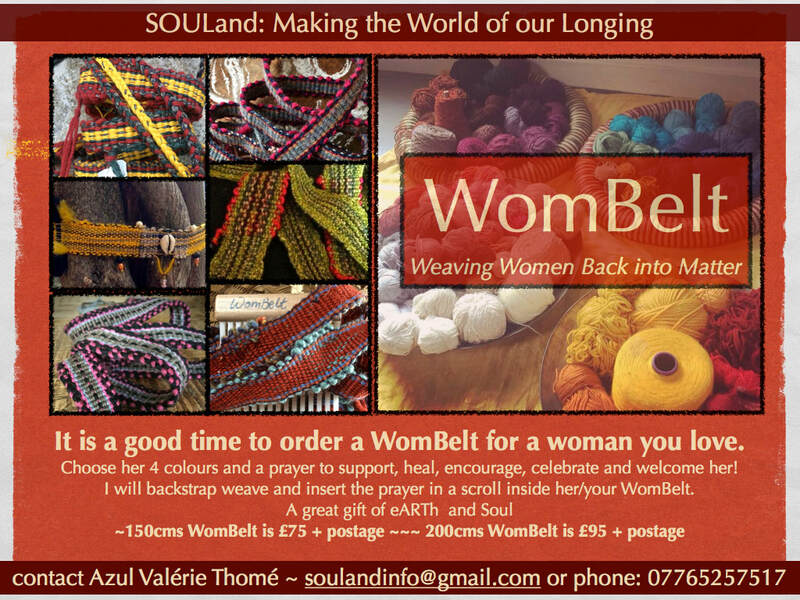 Making a Wombelt is a ritual, a rite of passage, a way back to mattering, to honour our womb and the space holding it. We are weaving ourselves and our stories back together for one another, to skill up, to mend, to actively pray for one another. A day ritual of backstrap weaving for men and woman called to make the world of their longing by weaving the soul threads of their lives around a tree. WomanFest, the first All Women Radical Participation festival. Azul wove for three days. She invited the women to respond to the question ‘What is your deepest wildest longing?’. 73 women wrote their response onto a roll of fabric. Each scroll was inserted into the weaving, therefore creating a collective Wombelt of our deepest and wildest longings. At the closing ceremony, the belt was given away and wrapped around the hips of Tanya Jacut, the visionary woman of this festival. Azul was invited to weave her Wombelts. She decided to create only one ~ a collective Life Wombelt weaving people’s longing into it. 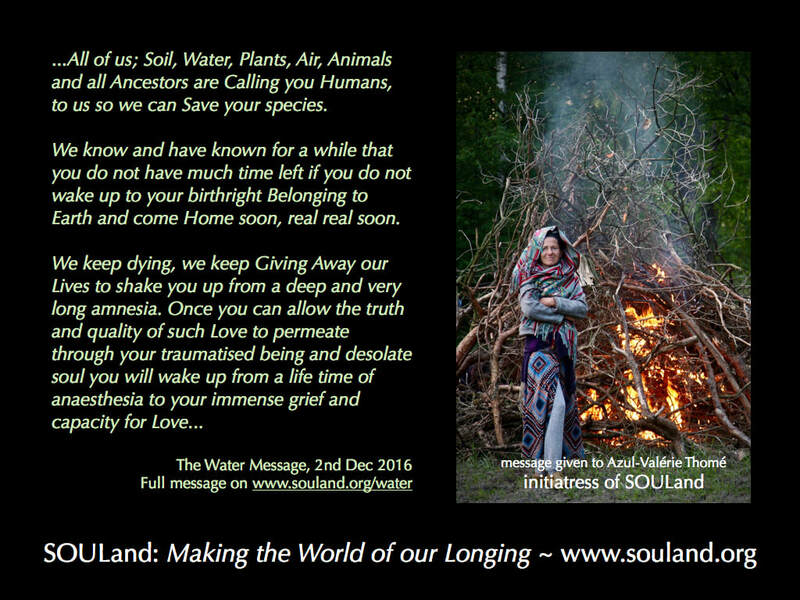 She invited people to respond to ‘What is the world of your longing and belonging?’. Their responses are written on little fabric scrolls and inserted in the weaving. There is 108 responses offerings in this belt. The belt is to be given to a cave yet to be found. A cave, a Kiva is an Earth womb able to listen to such a soulful gift. The archetype of the Queen when welcomed in its entirety is in service to something bigger than herself. The Queen with her King learns to listen and protect life both within the inner council and within her community of human and non-human beings. The other 8 archetypes of the woman are then at her service. They are the Mother, the Child, the Nun, the Maiden, the Lover, the Huntress, the Magician, the Crone. 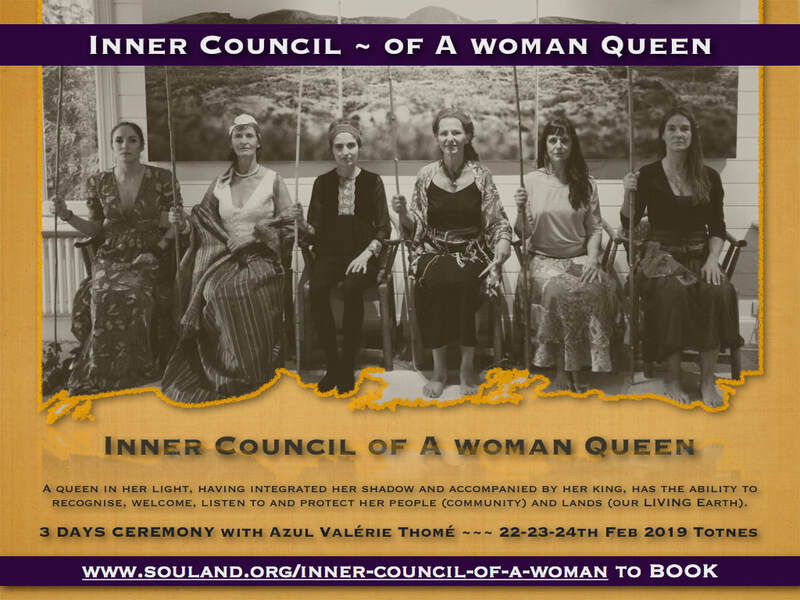 Listening to our inner council brings us to meet our inner archetypes, to welcome their lights and their shadows, to nourish decision-making for the thriving of Life. Each flag became an invitation for the Daimon of one archetype to find the place to belong and share their deep wisdom. The meeting of the archetype and the other than human invites and welcomes an animist understanding of our archetypes. This is a generous response to a prayer for soul sanity. Returning to Earth our silver, gold, precious stones, diamond, ivory, coral, platinum. All those have been extracted with terrible violence and destructive impact to all living beings. The mining destroys rivers, people, animals and whole ecosystems to feed our greed and addiction to power. I invite us to join me as I also return the result of my time as a goldsmith and silversmith in our mountains, forests, rivers and seas. To feel our sorrow, say sorry and make amend to come back momentarily to some resemblance of sanity. We can then honour our creativity and the alchemist in us by using local and renewable material in a sacred way again. 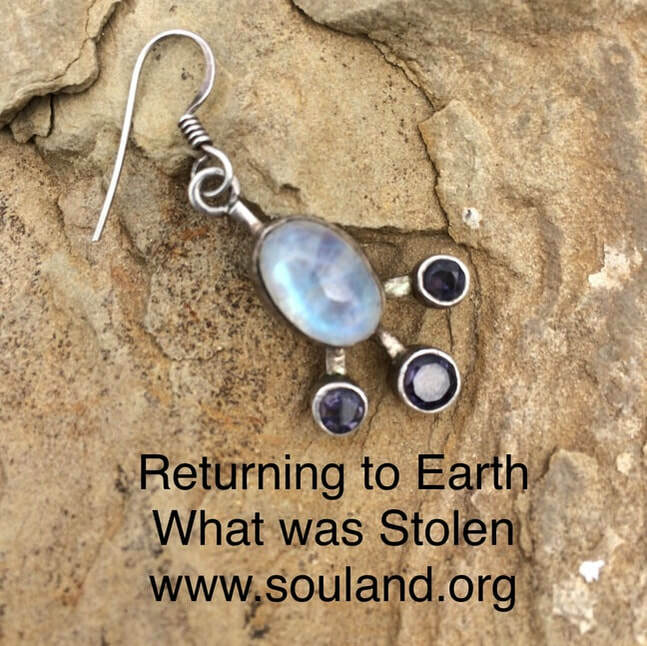 The SOULand Way means that the primary relationships are with our living world. 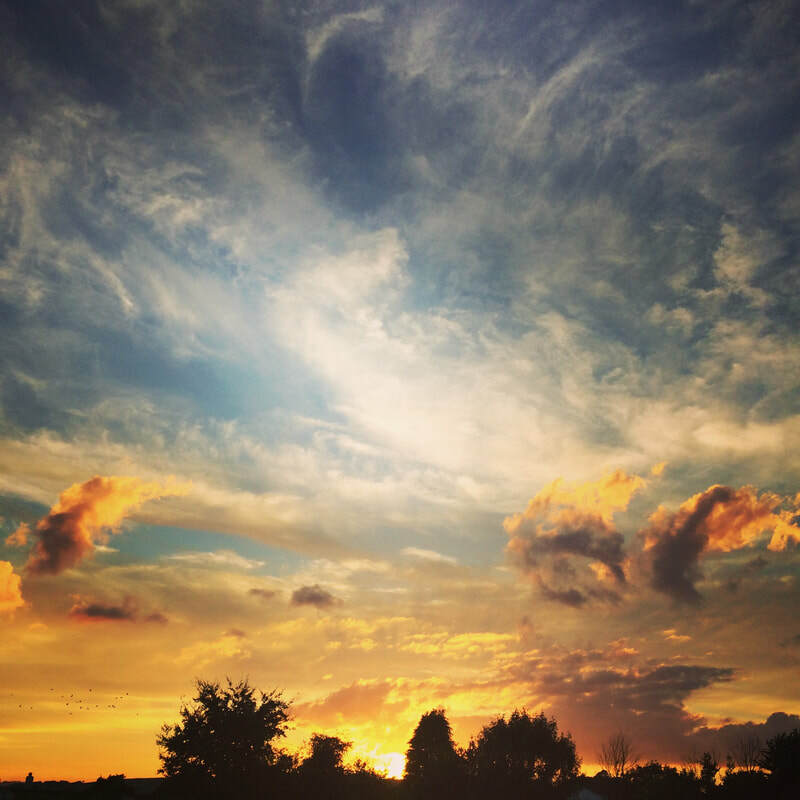 Azul mentoring work will care for the repairing of your relationships and conversations with Grief, Love, Death and Rebirthing as the backbone of being in this wondrous Life. 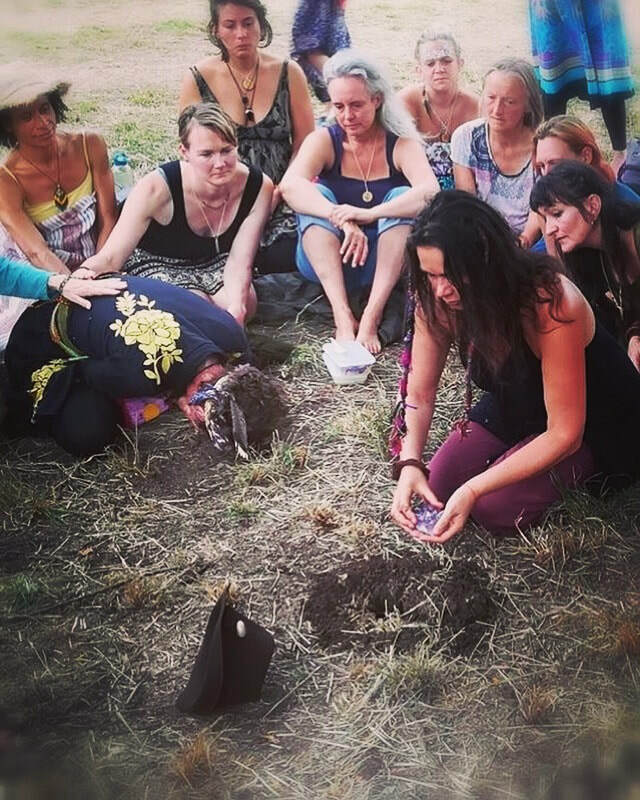 It is a weave of ancient earth wisdom, eARTh altar making, grief composting, deep soul work and courage ~ based on 20 years of experience of counselling, rituals, ceremonies and facilitation. Azul also holds a Person Centered Counselling diploma.